Event Re-cap: Bros, Brews, and Buttons! 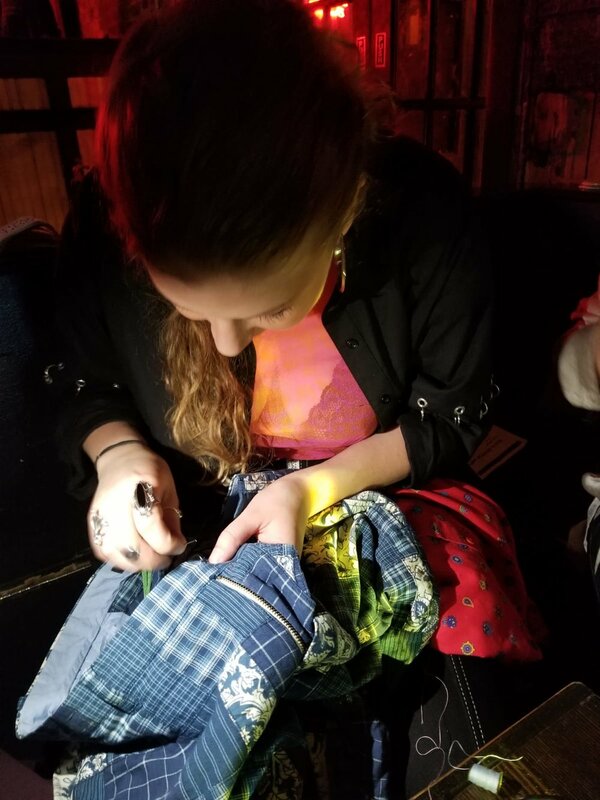 esa's first installation of our event series named "Not your Grandma's Sewing Circle" was a night of reflection on what sustainability means to different genders. During our "Bros, Brews, and Buttons" mending circle, Professor Beckendorf from the Fashion Institute of Technology gave us facts about how men define sustainability. Professor Beckendorf also promoted discussion through open-ended questions about what the attendees thought they knew about the subject matter - or what they had personally experienced. All twelve attendees at the Whiskey Barrel in Williamsburg, Brooklyn and filed out an impact survey at the end of the event. After a great night of valuable discussions, learning, and fun here is what resulted from that survey and great action shots of everyone hard at work! All who attended said they found value in what was discussed, and what they were participating in throughout the night. Thank you to all of the wonderful attendees in the building that night! Your contribution feedback is always appreciated. How Much Water Did It Take To Grow Your Closet?